Ever-popular ash trees are threatened by invasive beetles. ﻿﻿﻿﻿﻿﻿﻿﻿Ready for a road trip? If you were to drive across the middle of Texas from the Pineywoods to the Chihuahuan Desert, you could cross the ranges of each of Texas’ eight species of Texas ash. While ash is certainly widespread in Texas, its existence is in peril. An impending threat to the survival of ash trees in Texas looms in the form of an invasive beetle, the emerald ash borer, an exotic invasive beetle from eastern Asia. It was accidentally introduced into the U.S. two decades ago in crates and pallets made of ash wood. Since 2002, it has killed tens of millions of ash trees throughout the eastern U.S. and is making its way west. Today, the beetle spreads through contaminated ash lumber and firewood. It hasn’t made it to Texas yet, but has been found in Arkansas. Ash trees tend to grow in swamps, along rivers, streams and creeks, and on slopes and in canyons near water. Although rarely the dominant species in a woodland, they are essential parts of the understory and mid-story of plant communities in which they occur. They can be found in most state parks in Texas. Ash trees belong to the olive family. Ashes are easily identified by their winged fruit, called a samara, which contains a single seed with a long flattened wing. (Maples, in contrast, have two wings instead of one.) The winged seeds provide food for many kinds of birds and wildlife. Ash trees in Texas offer important stopover habitat for migratory birds using the Central Flyway. Among hardwoods, ash wood is prized for its toughness, strength and elasticity. It is valued in electric guitar bodies because it produces a bright, cutting tone with a sustaining sound quality. The bodies of horse-drawn carriages and wagons were made of ash because of the wood’s strength and ability to flex when suspended. In the early days of automobile manufacturing, car and even aircraft bodies were made using ash. Ash wood is used widely in meat smoking and barbecue. 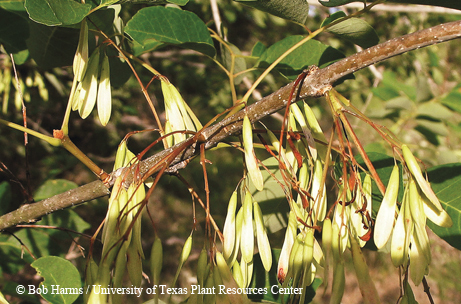 The Lady Bird Johnson Wildflower Center, in partnership with the U.S. Forest Service and Texas Forest Service, has begun the Texas Ash Seed Conservation Project to collect and bank seeds of all Texas ash species as an insurance policy against the possible extinction of ash trees in Texas. Texas Master Naturalists, the Native Plant Society of Texas, Texas Society of Arborists and local community organizations are being engaged to help with the project.